Chandigarh Group of Colleges, Jhanjeri won award for Best Institution for Placements in Punjab. The award was given to Rashpal Singh Dhaliwal, President CGC by Captain Amarinder Singh Chief Minister of Punjab .CGC Jhanjeri was facilitated for its achievements, dedication, ethics, innovation, contribution and excellence in the placements of its students. While thanking the CM Captain Amarinder Singh at the moment Rashpal Singh Dhaliwal, President CGC informed that CGC Jhanjeri gives top priority holistic development of the students which in turns helps its students in placements . It is a matter of pride that almost all the eligible students of institute are being placed in leading companies of India including Microsoft, Deloitte, SAP Lab, Sigma, HP, John Deere, IBM, Wipro etc .According to him more than 500 multinational companies visited and students were offered package of even 31 lakh .He further informed that college arranges a 360 degree Pre-Placement Training program for its students to enable them to crack various stages of interviews including Aptitude Test, Group Discussion, Technical Round and finally the HR Round. As a rare honor for its multifarious achievements, Chandigarh Group of Colleges, Jhanjeri , won award as the Best Educational Institute for Higher Studies in Punjab-2017. 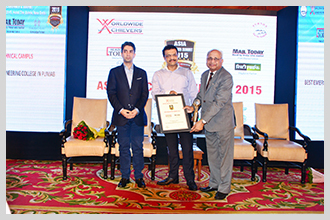 CGC Jhanjeri was selected for this award by Brand Icon for the International Excellence Awards given by them in various categories. The selection was made on the basis of excellent infrastructure, highly talented Faculty, Enviable results in academics, sports & other co-curricular activities and above all, the quality placements of the students. The awards were given by noted Bollywood actress Shilpa Shetty Kundra during a glittering ceremony held at Hotel Holiday Inn, Goa. Speaking on the occasion, Ms. Shilpa Shetty said that recognition of our efforts, their appreciation by the society and finally winning an award are special moments in our life. She congratulated all the winners and urged them to continue with their excellent work for the further betterment of the society. In a befitting recognition of the enviable placements of its students, Chandigarh Group of Colleges, Jhanjeri has won an award for ‘Best Institution for Placements in Punjab’. The award was given to Dr. Rajneesh Talwar, Principal, CGC Jhanjeri by Shri Anil Shastri son of Late Shri Lal Bahadur Shastri former Prime Minister of India. 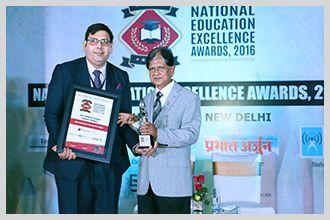 In a glittering ceremony of ‘National Education Excellence Awards, 2016’ organized by Praxis Media in New Delhi, CGC Jhanjeri was facilitated for its achievements, dedication, ethics, innovation, contribution and excellence in the placements of its students. In view of excellent placements of its first two batches of MBA students, Chandigarh Group of Colleges, Jhanjeri, Mohali has been conferred “ Award for Quality in Placements” by ABP News. 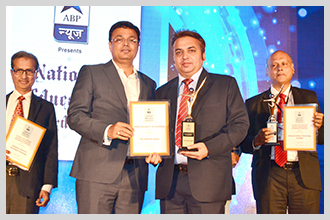 In a glittering ceremony held at Hotel Tajlands End, Mumbai, the awards for various categories were presented by Mr. Avinash Pandey, COO, ABP news. Some of the prominent persons present during the ceremony include Dr. David Richard Namwandi, Former Education Minister, Namibia, Prof. Michael Hodd, Vice Chancellor, Baze University, Dr. Christopher Hill, University of Nottingham, Malaysia Campus, Jamiu O. Busari, Maastricht University, Netherlands, Prof Zinyemba, Vice Chancellor Catholic University, Zimbabwe , Prof Y.K. Bhushan, Sr Advisor, IBS, Mumbai and many others. Based on excellent number of placements, pay package and a strong industry interaction, Chandigarh Group of Colleges (CGC) Jhanjeri has been awarded the Leadership Award 2015. 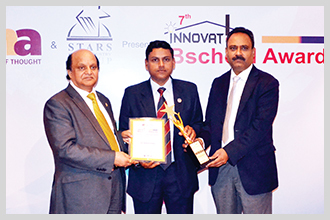 The Institute has been conferred this honor by DNA and Star of the Industry Group for their 7th Innovation B-School award ceremony at World Education Congress 2015. With this award, CGC Jhanjeri stands at par with to the prestigious institutes including IIM Shilong, ITFT New Delhi, GOA Institute of Management, Delhi Business School, FMS, Symbiosis Institute of Management, Dalmia School of Management, TAPMI Bangalore, Disaster Management Institute, Aditya Institute of Management and Nirma University, All these institutes have also been given awards during this function. The award was handed over to the Principal of CGC Jhanjeri by Dr. Y. K. Bhushan, Director IBS, Mumbai and Dr. Chandra Mauli Dwivedi, Director Dalmia Institute of Management Studies and Research. 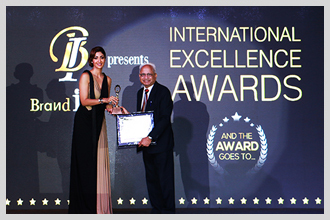 The award distribution ceremony was held at Taj Land’s End Hotel, Mumbai. The function was attended by a large number of dignitaries like Mr. Anil Shah, President and CEO, MRCC, Mr. Areff Salauroo, Group HR-LA Sentinelle, Mr. Barbara Opoku, Head-HR, AFB (Ghana), Mr. Franz Gastler, Executive Director and Co-Founder, Yuwa, Ms. Indi Seehra, London School of Economics and Political Science, Ms. Indira Parikh, President, Foundation for Liberal and Management Education, Dr. Kathleen Bates, Brandman University, Ms. Lakshmi Parasuram, HR Director (Mediterranean, Middle-East, Africa), Ms. Meghna Shukla, Syngenta Asia Pacific, Ms. Nereida (Neddy) Perez, VP-Global Diversity and Inclusion, Mr. Rajeev Dubey, President-Group HR, Mahindra and Mahindra Ltd, Mr. S.V. Nathan, Director, Deloitte Consulting India, Mr. Thiroshani, Ratnayake, Assistant VP-HR, Union Bank of Colombo and many more. 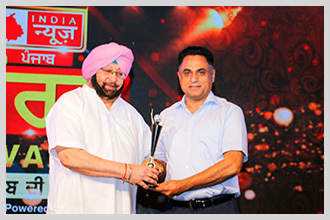 In recognition of their world class infrastructure, excellent faculty, unparallel academic results, appreciable achievements in sports & extracurricular activites and above all enviable placements, Chandigarh Group of Colleges (CGC), Jhanjeri, Mohali has been awarded as the “Best Emerging Engineering College of Punjab”. Established in 2012,the students of this college have created history by capturing highest number of positions in the Merit Lists of PTU. Apart from academics, the students have won a number of medals in various inter-college sports, athletic and cultural events organized by PTU & other leading colleges. The college is known for arranging conferences, workshops, seminars, expert talks, interactive sessions with experts from industry and activites to promote research & development. Above all, the management of the college gives top priority to placements of students. As a result, last year all the students of the 2014 batch were placed before they passed out.In the batch passing out in July 2015 a large majority of students have already been placed & for the remaining few, a number of companies are already scheduled to carry out campus interviews so that every eligible student is placed before he passes out. Chandigarh Group of Colleges, Jhanjeri honoured as the most innovative College in Punjab Shri Kalraj Mishra, Union Cabinet Minister of MSME gives the award. In view of various innovative initiatives taken in the fields of academics, extra mural activities and placement of students, Chandigarh Group of Colleges (CGC), Jhanjeri, Mohali has been awarded as the most innovative Group of Colleges in Punjab. 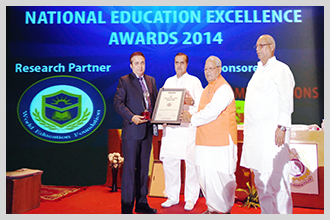 The award has been given by Shri Kalraj Mishra, Union Cabinet Minister of Micro, Small & Medium Enterprises (MSME), Govt. of India, New Delhi during a well attended function by Dr.Ashwani Kumar Sharma, Principal of CGC Jhanjeri organized by Education Excellence Awards 2014. The selection of CGC Jhanjeri for this award has been done on the basis of response of the opinion surveys conducted by One Planet Research for National Education Awards 2014. Some of the innovative ideas implemented by CGC, Jhanjeri in academics have resulted in its students capturing highest number of positions in the Merit Lists of PTU. Out of a total of 10 positions shared by more than 100 colleges in Punjab, third semester Computer Science Engineering students of CGC Jhanjeri have bagged 8 positions, clean sweeping first six positions of the University. 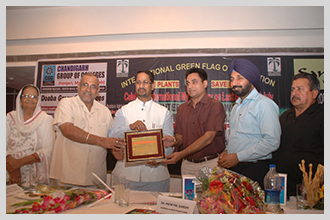 Chandigarh Group of Colleges (CGC), Jhanjeri, known for possessing state-of-the-art infrastructure added one more feather to its cap when it was honoured with the first prize for the best maintained & the most green institute of the state by International Green Flag Organization (IGFO). The organization, an NGO, has taken up various social activities like planting trees for saving our environment, saving water, minimizing fuel consumption, reducing water, air & noise pollution etc. S. Rashpal Singh Dhaliwal, President, CGC received the coveted prize from Shri Anil Joshi, Cabinet Minister (Industry & Commerce, Tech. Edu. & Indl. Training), Govt. of Punjab in a well attended function at Panchkula.